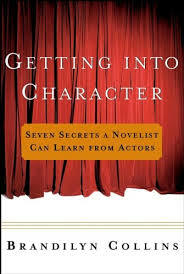 REVIEW: Getting Into Character: Seven Secrets a Novelist Can Learn from Actors by Brandilyn Collins (Wiley 2002). Getting Into Character: Seven Secrets a Novelist Can Learn from Actors by Brandilyn Collins. And Collins is no slouch either. She’s a multi-published author of adult and YA contemporary romance and suspense fiction. You can see her work here. Stanislavsky had a simple intention when he started collecting the techniques that would later become known as the “method”: He wanted to make it easier for actors to create believable roles. At the heart of his techniques was the belief that realistic and convincing portrayals required an understanding of a character’s inner life. The reason why this is so useful to writers is because all actors have is action. That is, an actor doesn’t have the benefit of telling the audience what they think all the time (the rare case of a monologue or a voice over in film notwithstanding). Typically, actors are bound by the same dictum that binds writers: They must show, not tell. This book gives you some nice techniques to help you move from 2 dimensional character sketches to 3 dimensional human beings. Each chapter begins with a description of an acting technique and an explanation of how that technique applies to the writing craft. Each chapter then concludes with study samples and questions which are intended to help you further your understanding of the concepts being discussed. There’s nothing deeply theoretical or overly complicated about any of this, and Collins does a nice job making Stanislavsky’s techniques accessible (and useful) to the uninitiated. I’m going to explore lessons from two chapters: “Personalizing” and “Action Objectives.” I’ll cover “Action Objectives” in another post, so for now, let’s see what Collins has to say about “Personalizing,” which is basically just the process of characterization. As no two human beings are exactly alike, so every role is a unique soul to be created that is distinctive and individual. Attributing mere general mannerisms to characters based on their age and social class will produce cutout dolls that may just as well be moved from play to play. Through discovering the inner character and from observing real life—how one person holds his head, how another walks or uses her hands—the actor must pull together a composite of mannerisms that creates the unique character being portrayed. The Technique of personalizing each character is just as important in writing fiction as in acting. Without personalizing, we face the pitfalls of cliched characters such as the “old man” or the “young woman.” Our adaptation of personalizing focuses not on hair color and body type, but on the discovery of a character’s inner values, which give rise to unique traits and mannerisms that will become an integral part of the story. Most of us understand Steps 1 and 2. This is where we fill out our character biography or where we freewrite until we feel like we know what our character wants. But the real fun begins at Step 3. Because this is where you start translating those internal values into outward facing attitudes. The idea of them being “outward facing” is critical, because it helps us understand the difference between an internal value like “the importance of saving face,” and the external expression of that value in terms of behavior. Step 3 helps us transition from a value that can only be told, to a behavior or attitude that can be shown. For example, you can’t show “saving face,” but you can show someone who reacts defensively to criticism, or someone who can’t admit that they’re wrong. Blake Snyder (of Save the Cat fame) is getting at the same idea when he advises writers to, “give ‘em a limp and an eyepatch.” As a dramatist, he’s trying to externalize certain inner values (and past conflicts) and one easy way to do that is to give characters visually distinctive traits. Not only is this a great way to differentiate characters, but it’s also a way to make the audience curious about who a character is (read: who is this character on the inside). Snyder might start with the trait and work backward, if the character’s role demands it. On one level, the difference between major and minor characters is whether the audience gets to learn how these external traits are linked to internal values. For major characters you do, for minor characters you don’t. By emphasizing the externalization of an internal life, Snyder and Collins (and Stanislavsky) are working towards the same goal: The creation of 3 dimensional characters. Step 4 is simply an expansion of Step 3, in which you ask yourself (or your character) if and/or how this attitude expresses itself in a physical behavior or mannerism. Does he hold his head back with his nose in the air, are his facial expressions stiff and guarded, or does he smile all the time no matter what in order to project an air of control and confidence? Whatever the answers, the point is that these outward facing attitudes and behaviors have a basis in some internal reality. This internal and external consistency is the “truth” of a character and what Stanislavsky was trying to get at. However you want! Your approach will depend on you and you’re writing style. Collins herself likes to begin with a basic plot and then let the characters reveal themselves as she writes. Depending how the values, behaviors, and/or mannerisms present themselves, she reverse engineers their relationships to each other. When I experimented with Collins’ ideas, this is the approach that seemed most organic to me. Collins also offers a more linear approach, one that begins with a character sketch and then takes the form of an interview in which she asks “why” until her characters start revealing their fundamental values; as they do, she continues to press until behaviors and mannerisms begin to emerge. You might prefer a voice journal, in which you let your character speak freely. Or you might be a watcher- you put your character in a situation and see what happens. No matter your preference, the point is to take the time to figure out how the inner life of your character relates to their outward facing personality and vice versa. Interview your character. Keep asking “why” until you discover an inner value or set of values. Then, ask how that value is outwardly expressed in their attitudes and behaviors. And then, ask how that attitude is expressed in a mannerism, tick, or physical quirk. Set a timer for 10 minutes and do a voice journal where you let your character talk about anything he or she wants to talk about. When you’re done, look for values, behaviors, or mannerisms that emerge. Since this journal is in their voice, look for linguistic quirks and tendencies as well. Identify one value or behavior, and freewrite for another 10 minutes about how that value connects to an attitude, and how that attitude connects to a behavior. If you discovered a behavior or mannerism, go backwards and ask how that behavior relates to an attitude and how that attitude reflects an inner value. Follow your character at home, at work, or at play. Watch them for however long you feel like it. Then follow the steps in exercise 2 to engineer or reverse engineer a connection between internal values and outward behaviors. What techniques do you use to get to know your characters? Do you start inside or outside? Did any of Collins’ ideas help you understand the process of characterization better? What does Collins get wrong?